Coconut Tea is a flavoured Black China Tea, one not only scented with coconut but also adorned with coconut pieces. It is a large loose leaf Tea producing a sweet, tropical flavour and fruity aroma with a notably bright liquor in the cup. But its colour is not the only thing bright about this Tea. Brighter still is its potential health benefits which, according to the latest scientific research, are almost unparalleled. Due to Coconut Tea being a Black Tea, it contains two unique antioxidants called theaflavin and thearubigin. Both antioxidants can neutralise free radicals in the body, which in turn lessens the potentially harmful effects of natural human oxidisation. But what does this mean in reality? When it comes to the frequent consumption of Coconut Tea, it means improved cardiovascular health, a boosted immune system and reduced risks of developing type-2 diabetes and even, although studies are preliminary, reduced risks of developing certain types of cancer. Most important of all, however, is the fact that Coconut Tea will never cease to surprise when it comes down to taste. After all, most people today enjoy Tea because of its flavour. Coconut Tea is, of course, no exception. We are most proud of the fact that we use actual coconut in the making of Coconut Tea, meaning its flavour is as close as one can get, in brew-form, to the much-loved tropical fruit. Coconuts grow on coconut palm trees, which in turn grow throughout the tropics and subtropics. The name “coconut” owes its origins to 16th Century Portuguese sailors who thought the three small holes on the coconut shell resembled the human face, and so dubbed the fruit “coco”, meaning “grinning face, grin or grimace”. The word “nut” was added in English years later. 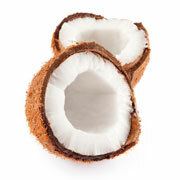 Perhaps even more interestingly, the coconut fruit is, in reality, a drupe, not a nut. Typically, drupes include peaches, plums and cherries; however, the “nut” at the end of “coconut” has remained. But the question still begs: when were coconuts first used in the flavouring of Tea? Sadly, there are no historical records of substance that can answer this question. Regardless, our Coconut Tea has, at least through us, been in existence for years. It is one of our most popular Flavoured Black Teas and continues to impress Tea connoisseurs around the world. And like all of our Teas, as well as our Coffees, Coconut Tea is packed fresh to order here in our Pluckley-based factory, nestled away within the stunning vistas of the Kentish countryside. How to Serve: First experience Coconut Tea without any accompaniments. Then, consider the additions of honey, lemon, milk or sugar. Tasting Notes: Coconut Tea has a smooth, refreshing flavour with buttery and creamy qualities. It is indulgent from the first sip until the last. Health Benefits: Again, thanks to the addition of real coconut pieces, our Coconut Tea is highly nutritious and rich in fibre, vitamins C, E, B1, B3, B5 and B6 and minerals including iron, selenium, sodium, calcium, magnesium and phosphorous. Furthermore, the Black Tea leaves in Coconut Tea can, when consumed as part of a healthy and active lifestyle, boost the metabolism, which in turn helps the body to burn fat quicker and more efficiently, which in turn helps the avid consumer to lose weight easier. It can also improve oral health, according to a collaborative study conducted in conjunction with the College of Dentistry at the University of Iowa and the Institute of Odontology at Göteborg University in Sweden. Both collaborative studies concluded that the Polyphenolic compounds present in Black Tea could kill or suppress cavity-causing bacteria from either growing or producing acid.